Several years ago I coined the phrase “MEMS frickin’ everywhere.” I shared my vision for MEMS enabling a smarter and better world. This was before the term Internet of Things (IoT) had taken hold. My catchphrase got me into a bit of trouble with those offended by my use of a modified expletive as well as skeptics of the potential of MEMS. Today that vision of MEMS everywhere seems passé and so obvious. That’s because the outlook for MEMS and sensors has never looked brighter – this was incredibly apparent to me at the 2015 International CES. At this year’s CES, in addition to hosting the Sensors Marketplace on the show floor and hosting a booth with several of our member companies, MEMS Industry Group (MIG) hosted its third annual conference at CES. In 2013 we were invited by CEA to host a 1.5 hour conference; in 2014 it doubled to three hours and this year we filled an entire day of content plus a cocktail party. Some might say that MIG is growing as fast as the MEMS and sensors industry it represents! 2015 has already been heralded as the year of the wearable device and MIG chose wearables and the MEMS/sensors supply chain as the theme for our conference. We packed an impressive lineup of featured speakers and panelists. There have been several stories already posted by the press on the conference track as well as our exhibit so I won’t retell the already told. Instead I’d like to share with you my favorite quotes, moments and impressions from the entire show. What’s my number one? Something that I’ve known for a while but now really believe is the HOLY GRAIL to both the future success of wearables and IoT/Everything: POWER. Power reduction and management through sensor fusion, power generation through energy harvesting as well as basic battery longevity. It became very clear from conversations at the MIG conference as well as in talking with folks on the show floor that the issue of power is the biggest challenge and opportunity facing us now. MIG’s recently announced Accelerated Innovation Community (AIC), an open source algorithm library for sensor fusion, is a good first step. AIC can help address the issue of sensor fusion to enable more powerful and power-efficient wearables and IoT/E. It has become clear that as an industry we’ve got to do more to address the issue of sensor fusion as well as power reduction, management and creation. In order to be successful we need more folks onboard to participate in AIC as well as spread the word to end-users and integrators. Won’t you join our merry band of sensor fusion evangelists? Favorite quote? It comes from David He, Chief Scientific Officer, Quanttus, when he described his company’s goal to find the “unkiller app” by enabling clinically accurate, contextual and continuous data that can empower people to truly take control of their health and yes, save lives. At our conference, David unveiled Quanttus’ never-seen-before health analytics that mapped the blood pressure of 200 people, which gave the audience a glimpse of the future described by Dr. Eric Topol in his book The Creative Destruction of Medicine. As someone who has been at the mercy of out-of-touch doctors who controlled my cancer treatment/healthcare, I welcome the day when I have a wearable device enabled by MEMS and sensors along with data analytics that gives me smart, useful and actionable data to help me guide and manage my own healthcare, thank you very much. Lastly, being at CES this year reiterated my love and affection for MIG members. From the members who have been with MIG since its foundation in 2001 like Intel to our newest member, Virtuix (whose President joined MIG only minutes after speaking at MIG’s CES conference), MIG members totally rock. It was a pleasure and a delight to be in their company for one week, even at the world’s most insane tradeshow (because it’s in Vegas, after all). MIG is a growing industry association in a growing industry. I’m confident that together, we can create a world that has MEMS and sensors frickin’ everywhere, but only if we continue to address the remaining challenges to commercialization. Won’t you join us? The MIG team traveled to Berkeley, California last week to host a workshop on MEMS Product Development Challenges, part of BSAC’s Fall 2012 IAB & Research Review. We were very honored to host a workshop with BSAC for the second year in a row. The presentations from the workshop are available to MIG members in the Resource Library on our web site. Karen Lightman kicked off the day by presenting an overview of MIG and the current state of the industry including potential areas for collaboration. 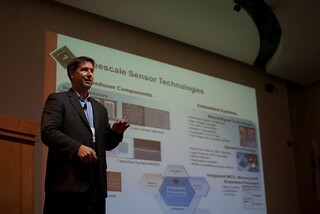 Dave Monk, Sensor Product Manager at Freescale presented a case study on MEMS product development evolution and lessons learned. Angelo Assimakopoulos, Director of New Business Development at Knowles Electronics discussed the history of Knowles and the challenges they faced developing a MEMS microphone. Next up was Peter Himes, VP of Marketing at Silex Microsystems. He discussed a foundry’s perspective on process standardization vs full customization. “MEMS is only limited by the imagination” was the title of the opening keynote presented by ST’s Carmelo Papa at MEMS Executive Congress Europe and in many ways this phrase perfectly summarizes the conference itself. All of the speakers on our four panels – industrial, biomedical/Quality of Life (QoL), automotive and consumer – as well as our keynotes – all conveyed that frontier feeling that MEMS can truly change the world. Sure we have some challenges to overcome (biggest being packaging), but the potential of having MEMS (frickin’) everywhere is a very tangible reality, if any of the predictions of MEMS Executive Congress Europe come true. Thankfully the numerous press who attended the Congress Europe have already done an impressive job of highlighting the panelists’ and keynotes’ more technical points – please refer to our Congress press coverage for the growing list of stories. So instead of retelling you who said what regarding what ISO qualification, I’ll use this blog to give you the more colorful side of the Congress (shocking disclosure, I know). And speaking of color, MIG’s Monica Takacs did a great job of capturing the Congress in pictures and we’ve posted them on our Flickr site; you will want to check it out. I am going to share with you my favorite quotes, saving my favorite for last. 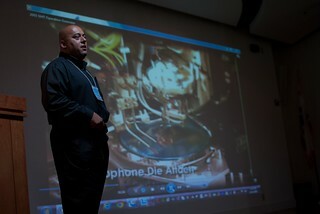 I’ll start with the one by our opening keynote, Carmelo Papa. When Carmelo was talking “off the ST script” his adorable Italian personality was a lot of fun. Like when he said that he couldn’t reveal ST’s biggest customer “even under torture,” but he’d give us some hints: “it is green, and delicious to eat.” What a great way to describe Apple. I also liked how he described MEMS as the “mouse for portable devices” as it enables a new realm of gesture. My next favorite quote was from VTI’s Hannu Laatikainen who I called a “Finnish Haiku Poet” when he said that we needed to “treat the car more like a human that can see, feel, hear, smell and taste.” Great stuff. I absolutely enjoyed hearing every single word coming out of the mouth of Dr. Berger of Clinatec and it wasn’t just because I am a sucker for a French accent. I loved his description of connecting technology with medicine and his passion for patient health, safety and welfare. He urged that there must be more money for clinical trials of technology for medical treatment to prove efficacy (not just money for consumer-inspired sport applications masking as healthcare products). I couldn’t agree more. I laughed when Stefan Finkbeiner introduced himself and stated that his company, Akustica/Bosch, hailed from Pittsburgh, the “MEMS center of the US.” Stefan then modified the statement by saying that Pittsburgh is the “MEMS capital of Pennsylvania” and “definitely the MEMS capital of Western PA.” My hometown is a lot of things, but not yet the MEMS capital of the US. But my absolute favorite quote from MEMS Executive Congress Europe was from Continental’s Bernhard Schmid. When someone from the audience asked the panelists if visual sensors will replace MEMS on automotive, Bernhard responded with a rhetorical question: “Have the eyes cannibalized the ears? No. Both senses/sensors are needed for smart automotive.” I guess he was inspired by Hannu’s earlier comment about the car’s senses being more human. I wouldn’t have expected such eloquence from a bunch of automotive engineering executives. But like the Congress in general, these guys impressed and surprised me. MEMS Executive Congress Europe was a fantastic success. I was expecting 100 attendees; we had 155. I thought we had a handful of sponsors; we had over 30. I look forward to building the content for this year’s upcoming MEMS Executive Congress US in Scottsdale (November 7-8) and yes, next year’s event somewhere in Europe and possibly in Asia. By design, MEMS Executive Congress is a unique professional forum where executives from companies designing and manufacturing MEMS technology sit side-by-side with their end-user customers in panel discussions and networking events to exchange ideas and information about the use of MEMS in commercial applications. And clearly, with our success in Europe, MIG is meeting a need in the market. Good thing it’s also lots of fun. 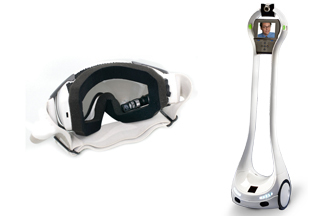 MIG looks forward to advancing MEMS across global markets at next week’s 2012 International CES®. It’s not too late to make your plans to attend! January 11, 2012 | 10:30-11:30amSpread the word to your colleagues and customers to attend this much anticipated session. In this session, you’ll earn how MEMS is truly driving the adoption of new consumer applications and products. MEMS at 2012 CES® PressroomIf you can’t make it to the show, be sure to check out the latest press releases related to MEMS at 2012 CES® in our online press room. MIG members, if you are attending the show and have a press release, make sure to send it to Kacey Wherley at kwherley@memsindustrygroup.org for inclusion. “One size fits all” just does not apply in MEMS manufacturing. Heterogeneous models—in-house, fab-lite and fabless—offer flexible approaches to the varied requirements of MEMS fabrication, empowering companies to make the choices that will keep them competitive. At the seventh annual MEMS Executive Congress , our panel of global MEMS fabrication business leaders will boldly explore the diverse approaches to manufacturing MEMS. Where are we today, how did we get here, and where are we going? What is driving this new era of fab-lite and fabless manufacturing and why do some companies make the choice to keep their fab in-house? And, how do variables such as current processes, price and time-to-market pressures, and the need for flexibility affect a foundry’s strategy? Representing very different perspectives on the manufacturing spectrum, our panelists will offer candid opinions on how to come out a winner in this increasingly competitive and revenue-generating market. Please join us Thursday, November 3, 2011, 10:00-10:45 a.m., for the panel, MEMS Foundry Models—In-House, Fab-Lite, Fabless. 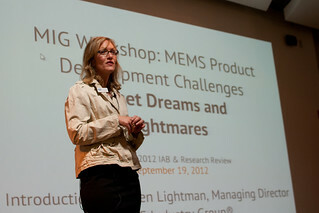 As a business rather than a technical conference, MEMS Executive Congress provides a unique forum for MEMS solution providers and OEM integrators to exchange ideas and information during panel discussions and networking events. This truly unique two-day event is the year’s must-attend conference for the entire MEMS supply chain. Meet your new business partner at MEMS Executive Congress! In addition to all the great content, MEMS Executive Congress also provides attendees plenty of networking time throughout the event that enables interaction among peers in a fun and casual environment. Wednesday Evening, November 2 – Dinner in the Open Sea Wing at the Monterey Aquarium. Monterey Bay AquariumSit by the largest window in North America and enjoy a fish-eye view of the sharks, tunas and sea turtles while chatting about that day’s panel of MEMS market analysts and their forecasts. Take a stroll and drift away with the jellies as you sample delicacies and finger foods. Dinner will be served at the host hotel, located on Cannery Row, the historic site of now-defunct sardine canning factories made famous by John Steinbeck. You’ll view the beautiful Monterey Bay while dining and exchanging conversation about the future of the MEMS industry.After dinner, we’ll continue with libations at the lobby bar. Drinks are sponsored by Coventor. The networking opportunities don’t have to end on Thursday. Join us for a golf outing at Pacific Groves Golf Links. Situated on the tip of the scenic Monterey Peninsula just 2.5 miles away from the Monterey Plaza Hotel and Spa, this historic 18-hole golf course overlooks Point Pinos and the Pacific Ocean and features both parkland and links-style nines. In its seventh year, MEMS Executive Congress is the executive conference that connects the MEMS supply chain with MEMS end-users. Through keynotes, panel discussions, and numerous networking opportunities, MEMS Executive Congress creates an intimate forum for decision-makers to grow the global MEMS market.